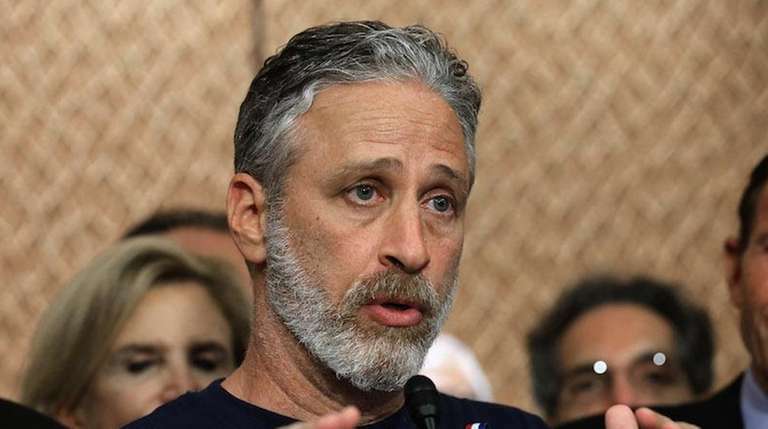 Gone, hardly forgotten and still endowed with enough clout to ensure full use of a show he once called his own, Jon Stewart returned to "The Daily Show" Monday night to rally funding support for the expired Zadroga act for 9/11 first responders. "I have this issue I care very deeply about it and want to get some attention to it, but realized i don't have a show," Stewart said at the show's outset Monday, after wandering on to the set behind current host, Trevor Noah who wondered whether his predecessor was lost. Stewart was then given the entire edition to push for permanent funding of an act he's had a public role in for over five years, perhaps most notably in 2010, when he convened a panel of first responders on the show to urge passage of the act. Those included FDNY first responder, Ken Specht -- formerly of Levittown -- who was also on Monday's edition. The James L. Zadroga 9/11 Health and Compensation Act -- first responder James Zadroga of the NYPD died Jan. 5, 2006 -- expired Oct. 1 and members of the New York congressional delegation have been attempting to renew the act ever since. They may have just received a big assist from a shaming episode -- and yes, unprecedented for a talk show host to commandeer his former show in support a favored cause -- that named names. Notably one in particular: Senate majority leader Mitch McConnell who (Stewart said) had stalled funding of the act. A frequent and favorite target of ridicule during his run on "TDS," Stewart Monday said of the Kentucky senator, he's "an enormous obstacle unwilling to move forward purely for political reason." The full episode can be seen here or here, and for more background on the Zadroga act, and how it's impacted some Long Island first responders, you might want to check this out. Stewart left "TDS" in August, and since signed a pact with HBO to create content.